The Windsor Public Library (850 Ouellette Avenue) is holding a gigantic book sale on Friday and Saturday, October 26 and 27, from 9 AM to 5 PM. 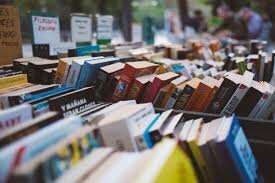 There will be thousands of titles to choose from, covering all genres of reading and viewing tastes. Hardcover books and trade paperbacks will be priced at $2 with mass market and small paperbacks at $1 but we’re encouraging everyone to pick up a plastic bag and fill it with books for only $2 or fill a cardboard box for $5 (we supply the bags and boxes). This year there is a large selection of materials in: Arabic, Chinese, Croatian, German, Hungarian, Italian, Romanian, Russian, Serbian, Spanish and Urdu. There will also be a number of large print books available.